Recent estimates indicate that North Korea has expanded its nuclear arsenal to 30 warheads, and may control enough weapons-grade fissile material to double that number in about three years. The Institute for Science and International Security in Washington attributes this growth to increased production in plutonium and uranium. It’s a drastic change from previous assessments, as in 1999 the US believed Pyongyang only had one or two weapons in their nuclear arsenal, with the possibility of increasing to 10 by 2020, according to a Defense Intelligence Agency report obtained by The Washington Times. Institute founder David Albright told the Times, "The bottom line is that North Korea has an improving nuclear weapons arsenal … The last several years have witnessed a dramatic and overt buildup in North Korea’s nuclear weapons capabilities." 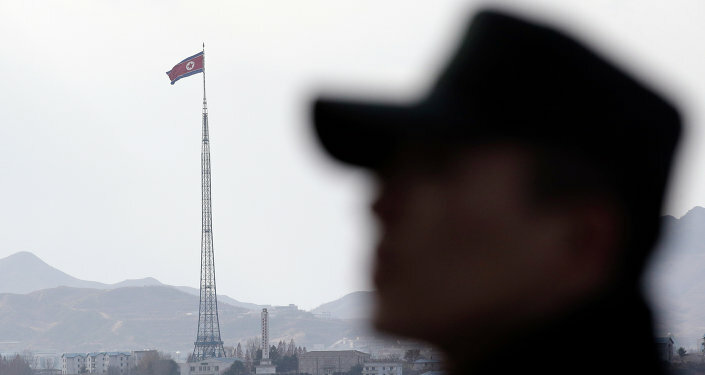 This means that the Democratic People’s Republic of Korea (DPRK) is emerging as a world nuclear power with the ability to strike nearby countries, and Pyongyang is reportedly already working on a weapon capable of reaching the US. Pyongyang could "theoretically use a satellite launcher" now to launch a nuclear strike against Washington, according to Albright, but "not with any reliability." He added that whether Pyongyang can build reliable warheads for intercontinental ballistic missiles (ICBMs) remains uncertain, though it’s likely they’re able to affix a smaller warhead on the Nodong missile, a shorter-range projectile capable of striking Japan or South Korea. During a recent trip to South Korea US Vice President Mike Pence declared that the policy of "strategic patience" with Pyongyang, instituted by former US President Barack Obama, is over. Trump Not to Tolerate Threats to Allies, Partners From North Korea - State Dept. Tensions between the US and the North have reached a fever pitch as multiple reports indicate that Pyongyang is close to conducting its sixth nuclear test, an act that would likely lead to open conflict. The US militarily is reportedly considering shooting the North’s test missiles out of the sky in an effort to diffuse tension, but some feel this would only lead to escalation. US officials also reportedly told NBC last week that the country was considering launching a preemptive conventional strike against the country should a nuclear test appear imminent. Pyongyang has previously threatened to reduce the US "to ashes" if Washington conducts a preemptive strike, which seemed ever more possible as US President Donald Trump spoke of a US Navy carrier fleet purported to be headed to the Korean peninsula, though later the vessels were seen sailing in the opposite direction toward Indonesia. Defense officials later insisted that the strike group may arrive in East Asia "sometime next week," according to US Naval Institute (USNI) News. Spicer deemphasized the possibility of a military strike against the North on Monday, saying that nations like China can help pressure Pyongyang into denuclearization. Though Beijing has cut off coal imports from the DPRK, the US has continually pressed China to step up its role in addressing the North Korea issue. President Trump recently ordered a controversial strike on Syria’s Sha’irat air base, with some positing that he purposefully timed it to coincide with his meeting with Chinese President Xi Jinping, so as to pressure China into getting in line with Washington’s aggressive stance.